The most popular Flower in this world, Roses (of shades Red, White, Yellow, Purple and Pink) are the ultimate beautiful living objects of this world. They possess a bewitching fragrance, a dazing grace and overwhelming tenderness and vary in sizes from miniature roses to climbers that climb up to seven meters of height. Deriving their name from the Latin Word �Rosa�, Roses are native to Northern Persia and in modern times are cultivated mostly in Netherlands. White Rose is the logo of exactitude, integrity and rectitude, whereas the Yellow Rose, a popular mark of friendship, upholds the vibe of pure platonic bond and that of enthusiasm and earnestness. Red Rose is the timeless emblem of any emotion that is profound whether that be love, yearning or passion and Orange Rose signifies vigor, dignity and dreams and competes with Red Rose as messenger of love. The 5 Red petals of a Red Rose are also believed to be the signs of Jesus Christ�s 5 wounds of crucifixion. Light Pink Roses denote geniality and morality and deep Pink Roses imply applaud and thankfulness. At pace with its affecting color, Lavender Rose is the motif of charm and also defines royalty and luster. Green Rose signifies bliss and calmness and also voices out wishes for sane health and an abundant life. The bloom of Christmas Rose implies relief of misery and Tea Rose is the mark of remembrance. The Damask Rose defines novelty and brightness and is esteemed in the Persian culture as the envoy of love and Tea Rose stands for remembrance that lasts till times. Garden Rose is the symbol of exoticness whereas Wild Rose denotes the fervor of integrity. Along with roses, rosebuds of different shades also imbibe within them certain significances. White Rosebud is the sign of maidenhood whereas Rosebud of color Moss helps one to admit his/her love for the soul-mate and the Rosebud of color Red exemplifies that which is both kosher and captivating. A tiara made of Roses is availed by human society to esteem the faculty of a true achiever, a collection of White and Red Roses defines the singularity of two souls and a bouquet of fully bloomed Roses transmits the message of sincere gratefulness of the sender towards the receiver. Whereas 25 Red Roses voice out compliments for the receiver, 12 Red Roses shows the desire of making the receiver a part of life and 1 single Red Rose is the eternal envoy of the three chaste words �I Love You�. 1 single White Rose utters about the chasteness in feelings, 1 single Yellow Rose endorses the gesture of making a new friendship and 1 single Pink Rose is the logo of affection. 1 single Orange Rose says �I am proud of you� and 1 single Lavender Rose represents obsession for someone. Taking a Rose from a person with the right hand signifies alliance of thoughts between the giver and the taker---whereas acceptance of the same with the left hand depicts disparity of thoughts between the two. The classical floral symbol of weddings is the White Rose which is also titled as the Bridal Rose. Roses of hues Red and Pink (since they signify lasting affection and endearment) are the all-time popular choice for greeting couples on their anniversary of �being together�. Recognition of someone�s help and thanking that particular one for the support is done best by gifting that one Roses of dark Pink color. Pink Roses or Roses of color Cream make the right choice for the distinctive time of one�s First Date. 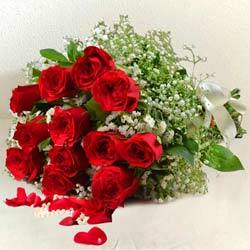 Lavender Roses and Red Roses are the peerless picks of Valentine�s Day. While Lavender Roses are the suitable ones for new lovers, Red Roses match the passion of a maturing relationship. Yellow Roses are the unparallel blossoms to gift to true close friends during the Friendship Day and are also popular gifts for attending house-warming parties and Pale Pink Roses can be send to share the grief of the near ones of a departed individual.